This haunting remix is finished. We created 54 remixes. With Halloween around the corner, filmmakers, game devs, app creators, and party goers will be on the hunt for haunting soundtracks! Let’s collaborate on spooky soundbeds, terrifying tunes, eerie anthems, and bone-chilling ballads! Would you like to make your ccMixter music available for people to license AND to receive a portion of advertising revenue? Email us to sign up for ccPlus! Do you love ccMixter remix events? Pledge a monthly donation to show your support. 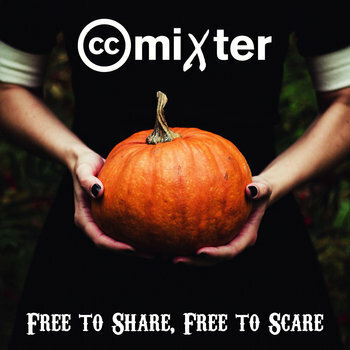 Check out ccMixter’s Patreon page and pick the reward tier that best matches what you can afford to make ccmixter possible. Uploads for Ghost Notes Remix Event will be accepted from October 1st through November 1st. Happy Halloween! Speaking of sounds wich are not in plain sight I have uploaded a number of samplepacks here. I think the they would be perfect for this, can they be included? Your more than wecome, its my kind of sound. I just love ambiance in music especially if its of the eerie, spooky, hair standing on your back type. Your samples are now listed in the Ghost Notes remix event! Thanks for this source material. I’m so excited for this remix event! Sing us a terrible, blood thirsty, howling at the moon tune Madam Snowflake. Mixters will cringe at the feet of the dark queen. Oh my! The challenge has been made! Here is playlist of haunting remixes resurrected from the graves of the dark past here at ccmixter. There are many many more mixes lurking in the shadows. These are some of my favorites. Post yours here as you begin to remix new terrifying tunes. If you upload a 128k MP3 so your contribution can be listened to be streaming, instead of download, it will be helpful. Thank you. Hi. I believe my files are now able to be streamed. Please let me know if so. Thank you, my friend. Are you wanting to submit this mix as a Ghost Notes remix? or as a sample for folks to create new mixes with? I know it’s close to Nov. 1 and I haven’t submitted anything for “Ghost Notes” specifically yet, but I’d just thought of this remix the minute I’d read what the theme was; I tagged it with ghost_notes just for that reason; but of course, there’s nothing to stop folks from remixing it under its current license, yes? I found out within the last hour that apparently the world’s phytoplankton has lessened by 40% since 1950, so my upcoming submission will be dedicated to their billions of ghosts; one can only hope we aren’t seeing our own, in the face of such loss. truly scary…I know. And I am afraid it will come back to haunt us and the next generation and the next. these ghosts are not in our imagination. Share it with your zombie friends and vampire lovers, your ghostly workmates, and your dark master. Cool, but way too distorted processing to listen to, imho. Checked out the LUFS (Loudness Units Full Scale) of the first track and it’s -4dB which is close to plain noise. Needs to be redone. Thanks for your ears Zep. I hear what you are hearing too. Not sure why, but will do my best to fix it so the music shines! What frighteningly wonderful remix event!!! I’m glad I popped in and had the spoons to participate. I love the theme and remix events so very much.